We are delighted to announce that the Scottish Dental Awards 2019 are now open for entry. The Awards celebrate the best of dental practice and patient care in Scotland. We are looking for those individuals and teams in primary and secondary care, NHS and private practice, who place their patients at the heart of everything they do and continuously inspire, innovate and lead to deliver excellent patient care, to develop and enhance the dental profession and, ultimately, to improve oral health in Scotland. This year we have introduced new categories and new criteria to ensure that the Awards are inclusive and representative of the entire dental profession. We are very keen to encourage involvement from the whole dental team, hygienists and therapists, dental nurses and DCPs. We are also broadening out categories to recognise researchers, academics and the institutions that promote ongoing professional development and education. Practice of the year – which is now awarded in two separate categories, General Practice and Referral or Specialist practice. Closing date for entries is Friday March 8, 2019, more information about the categories and criteria can be found here. 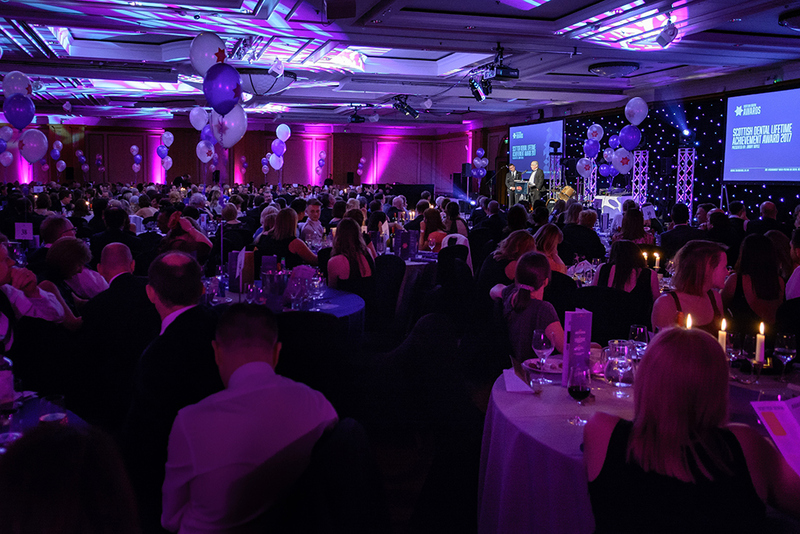 The Scottish Dental awards will return to the Glasgow Hilton on Friday 26 April, with award-winning comedian Fred MacAulay hosting and music by Glasgow-based DJ group Pretty Ugly Club, this black-tie gala event is not to be missed. Tickets for the Awards Dinner can be purchased by contacting Ann Craib at ann@sdshow.co.uk or 0141 560 3021. Our education programme covers various eCPD topics, the workshops are small hands-on style talks each able to seat around than 20 attendees. See the listings below for more information and to book, with 27 talks across nine sessions and three rooms there is an experience for the whole team. At Dentsply Sirona, we are focused on empowering dental professionals to provide better, safer, faster dental care. We work with them to envision what‘s possible, then provide innovative solutions to achieve it. Education and support help move each procedure forward, ensuring the benefits of our innovations are realised. Contact Ann Craib on 0141 560 3021 or email Ann to find out about how you can exhibit or advertise at the Show. The leading industry publication in Scotland, Scottish Dental magazine is available free of charge to every dental professional in the country. Click here to visit the magazine online. Connect is one of the UK’s leading creative communications companies offering a complete solution, from planning and production to distribution and measurement. Whatever your medium, whatever your challenge, whatever your budget – when it comes to contract publishing, you’ll struggle to connect with a better solution.